This painting was recognized as second prize at the annual art exhibition in the Palacio de Bellas Artes and sometimes is called with name of "Nucleus of Creation". But Frida Kahlo referred it as "Moses" in a written description of this painting. This painting was commissioned by Don Jose Domingo Lavin. Lavin asked Frida Kahlo to read the book Moses and Monotheism by Freud and paint her understanding and interpretation of this book. Before this Frida has painted a portrait of Lavin's wife in 1942. This painting was drawn as a miniature mural, maybe as a result of influenced by her famous husband Diego Rivera, who is famous as a muralist . In this painting, in the center is an abandoned baby which has a third eye in his forehead. This baby's face resembles Diego Rivera and Frida always paint him with the third eye of wisdom in her other paintings. The birth is under a sun flanked by heroes, gods, other human beings and the hands of death. In the foreground there is a baby in the conch and which is spurting waters into the shell. Frida referred that as "symbol of love". There are branches extending out from the dead tree trunks. 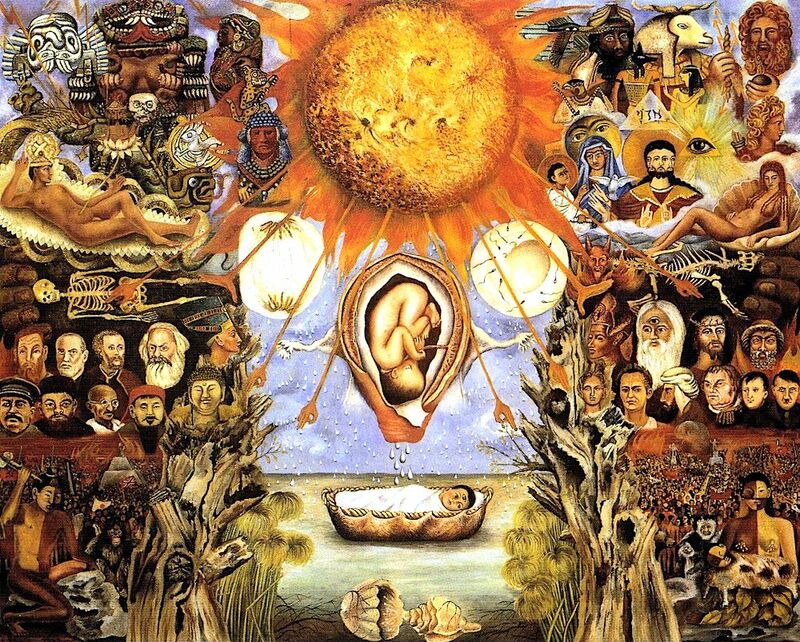 In many of her other paintings Frida use this to refer the life and death cycle in the world. I read the book only once, and started the painting with my first impression. Later I read it again, and I must confess I found my work most inadequate and quite different from the interpretation Freud analyzes so marvelously in his [book] Moses. But now there's no way to change it."